I guess that's a decent amount of stuff after all. But if I'm going to be on track for CoCo this year, I can't just take a two month break from sewing again! Navy blue swiss dot Regency - Done! Black silk taffeta bustle ballgown - Done! Child's Victorian Gown - Done! Daniel Deronda Riding Habit - Still hasn't happened, and is no longer on my specific upcoming goals list. 1860s Fully Handsewn dress - Didn't even pick this up all year. Maybe someday, but probably not anytime soon. Turquoise Silk Mid-19th c Giant Ballgown - I kind of knew this was going to be a 2017 project, and sure enough, it will be. Fur-trimmed bustle-era skating outfit - Coming up next; I've already started cutting pieces out. Winter bustle gown - Almost done! Super-secret Disney-related project - No longer super secret. This is the Snow White Designer Disney dress, and will be made for the CoCo pool party this year. In June, I added an Elizabethan kirtle and Mary Poppins Jolly Holiday to the list, both of which I have since completed. And here's picture proof of everything I made! I think that's everything. Overall, not a bad sewing year, though being unemployed for the first eight months of the year certainly helped in that, and as you can tell by my posts, my sewing has definitely slowed down since I started working in September! Hmm, just off the top of my head, I certainly haven't done much since CoCo. Maybe going through everything, I'll realize I was actually productive this year? 1. 1831 Archery dress Done! 2. 1829 Orange ballgown Done! 3. Corded petticoat to go with both of the above dresses Done! 4. 1830s bathing suit Done! 6. Daniel Deronda riding habit (already have the fabric) Still have the fabric. Maybe I'll actually make it this year? 7. Little Red costume from Into the Woods Done! 9. Handsewn 1860s gown. At this point, I'm still determined to do this fully handsewn, so who knows when/if I'll ever finish it. If I let myself do it by machine, I'm sure I would have finished it months ago... Still on the list. I just haven't had the time/patience for that much hand-sewing. So overall, I guess that wasn't too bad. I definitely need to start sewing again soon if I'm going to be at all on track for CoCo though! I didn't get to make a lot for myself this year. In fact, I only achieved four of my nine goals... I feel like I started off the year halfway decently, but theatre kind of took over in the last few months, so since CosCol, I have made a whopping one thing for myself. I also made several things while I was working at the sewing machine shop in the 1st half of the year, and a few things for myself, including two skirts, a pair of bloomers, an embroidered shirt for my mom, and an apron. And I did alterations on my Edwardian blue skirt, my Regency stays, my 1903 outfit, and my BF's Civil War uniform. 2. 18th c mitts - I think I actually mocked one up at one point. Not sure what happened to it. 4. Seaside bustle gown and hat (I already have fabric earmarked for it). 5. Regency evening gown (a sari is on its way to me - Well, it turned out not to be evening, but whatever. 8. Most likely a commission for Queen Elsa from Frozen. 9. Button boots. I still want to figure out how to make them. - No. Though I just ordered a pair of Fugawees! Oh, and I didn't move to LA, which was my plan. Instead, I've been with my BF since last Jan. Though I have now had 3 costuming jobs in local professional theatre, and pretty much decided that I don't want to do that as an actual job. It felt like I didn't do that much this year, but apparently, I did a fair amount, just all in the first half of the year. I've also done a bunch of projects for work, including an elastic-waist skirt, a reversible tote bag, a minkee monster, an embroidered tote bag, an embroidered purse, two embroidered minkee monsters, two embroidered towels, two embroidered pin cushions, and two embroidered gift tags. 1. Finish the riding habit. - Done! 2. The Robe a la Turque. - Done! 3. 18th c red cloak. - Done! 4. 17th c gown. - Done! 5. Regency corset. - Done! 6. Regency day dress. - Done! 8. Edwardian jacket for my mom. - Done! 9. 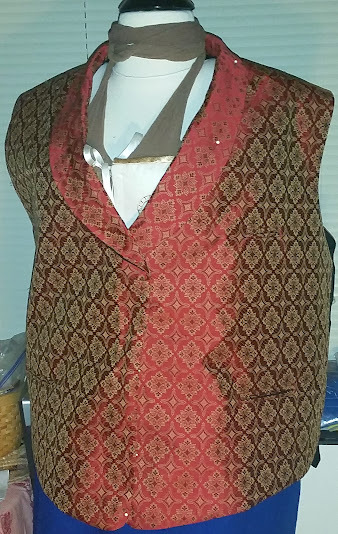 Victorian waistcoat for my dad for Dickens next year. - Still on the list. 10. 1950s cotton-printed dress to wear to Disneyland before CosCol. - I changed the plan on this one, but finished the new plan. 11. Victorian button boots. - Hasn't happened yet, but I hope it will! 12. Possibly a pet en lair or caraco. - Pet en lair. Done! So at least I got pretty much all my goals done! 2011 was a pretty productive year for me, especially in the first few months. March: The beginnings of a hand-quilted petticoat, which I never really worked on again after that month. Maybe someday. I think I also made my short-sleeve chemise blouse in March, but since I never blogged about it, I can't remember. Nothing in April, since I was busy moving across the country. Overall, not too shabby. Tomorrow, I'll post my list of everything I want to make for 2012. Happy New Year!